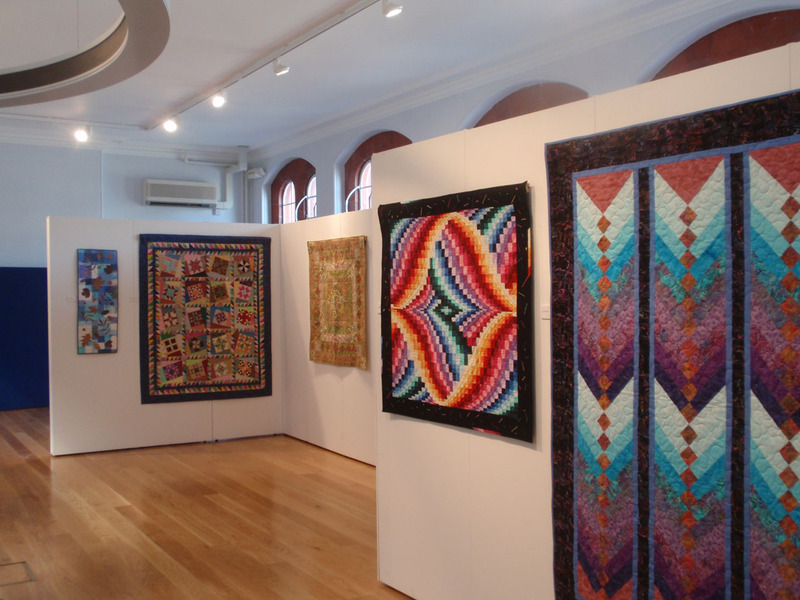 If your around Cardiff Bay in March pop into The Pierhead and see our quilt exhibition ‘Bonded by Threads, Old Crafts by Modern Women’,that we were asked to put together by the Women’s Arts Association in conjunction with The National Assembly for Wales. The exhibition was put together to celebrate International Women’s Day, which was on March 8th but you can see the exhibition at the Pierhead from the 8th to 31st of March, 10.30am to 4.30pm, admission is free. The quilts in this exhibition were made by customers and tutors of Busy Bees Patchwork. You will see quilts made by beginners right up to internationally know quilters. It was very difficult choosing only 18 quilt from the vast array of treasures we have on offer at Busy Bees through our customers and tutors. Sandie Lush, Jan Hassard, Judi Mendelssohn, Sally Ablett and Maryke Phillips are five experienced quiltmakers who are very well know in the quilting world. We feel very lucky to have them as tutors at Busy Bees. Marianne Mcmorrow tutors and works in the shop at Busy Bees. Lots of Marianne quilt can be seen displayed in Busy Bees shop. At the exhibition Marianne has put in a quilt that she made at a Sandie Lush workshop. It shows the other side of the quilt that Sandie has in the show. Sue Phillips started her quilting life at a beginners course at Busy Bees. She now has her own very successful business ‘School House Quilting’ where you can take your own quilts to be quilted by Sue with her long armed quilting machine. Jan Jones,Brenda Edwards, Pauline Widdas, Miriam Ham, Gina Smith, Jenny Wintle, Marion Bennett, Marilyn Goman, Marion Bennett and Sylvia Olley are all customers and friends of Busy Bees and have made their quilts at workshops or with fabric from Busy Bees.